I am laughing out loud. I also hate touching raw meat..and use latex gloves. However...I haven't tried that brand and may need to. I am a germophobe freak sister with you!! Stay cozy. I saw these gloves at the store the other day. I love that you use them. Are they recyclable? Just kidding:) I know how you like to recycle, but I would definitely make an exception to avoid raw meat! So, tomorrow is our 7th snow day. I'm looking for new blogs to read. Any suggestions? Genious. Because touching raw meat is disgusting. But seriously, I need to get some of those gloves. I'm enjoying the Tell about it Tuesdays! I knew that you used gloves to handle meat. Now if they would only work for the smell - I hate the smell of raw meat/chicken. No matter how fresh it is, it smells bad to me. I still need to try the dry shampoo from a few weeks ago. That's a great tip! I so agree about raw meat...especially chicken! (I became a complete germophobe in nursing school...) I haven't seen this brand at the store, but I usually buy vinyl gloves in the pharmacy section of Walmart--about $10 for a box of 100. Peace of mind for my germophobic brain...priceless. I hate the feel and smell of raw chicken. When I was pregnant I could NOT handle it without feeling sick. Raw meat doesn't bother me. Except when I'm making sausage balls then I get all nauseated. Maybe I need some, too! 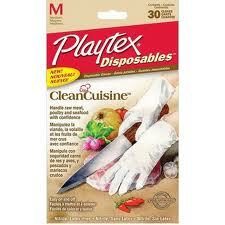 I loved the gloves idea & looked for them at my local groceries and even Walmart. Sadly I couldn't find them anywhere. Do you buy them at a particular store, and what section are they in? (cleaning supplies?). I'm wondering if they just don't have them in central IL. I can always probably find them online, but just thought I'd ask. Ooh! I'll have to find some! I think they would be great for cleaning the toilet area too! It grosses me out.